Purpose: The purpose of this study is to construct a guided bone regeneration membrane that is similar to bone components and structurally resembles the native extracellular matrix with sufficient antibacterial properties. Materials and methods: A novel type of biomimetic and bioactive silver ion-loaded calcium phosphate/chitosan (Ag-CaP/CS) membrane with antibacterial ability was successfully developed by incorporation of silver ion-loaded CaP via a one-step electrospinning method and subsequently crosslinked with vanillin. 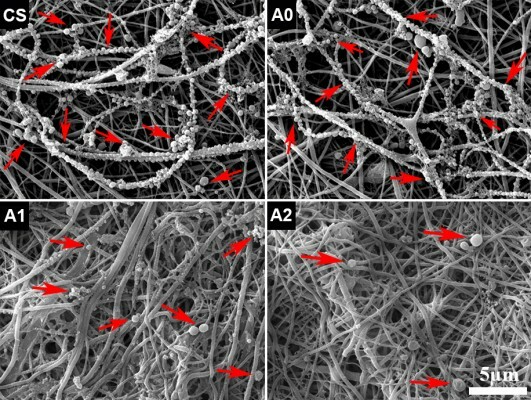 Results: Evaluation of the physicochemical properties revealed that the fabricated fibrous membranes mimicked the extracellular matrix structure and the addition of CaP significantly increased the mineralization ability of the membranes. Importantly, the Ag-CaP/CS membranes exhibited a sustainable release of Ag+, which in turn inhibited the adhesion and growth of Staphylococcus mutans. The results of cell adhesion and MTT assay revealed that the Ag-CaP/CS membranes were cytocompatible with bone marrow stromal cells. Conclusion: The fabricated electrospinning Ag-CaP/CS nanofiber membranes with excellent biocompatibility and strong antimicrobial properties have great potential to be used for guided bone regeneration.